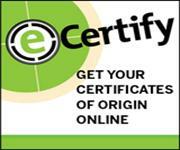 A Certificate of Origin is an important international trade document that certifies that goods in a particular export shipment are wholly obtained, produced, manufactured or processed in a particular country. They also serve as a declaration by the exporter. Virtually every country in the world considers the origin of imported goods when determining the duty that will be applied or, in some cases, whether the goods may be legally imported at all. Preferential COs, which certify that goods are subject to reduced tariffs or exemptions when they are exported to countries extending these privileges. COs may be needed to comply with Letters of Credit, foreign Customs requirements or a buyer’s request. The Miramar Pembroke Pines Regional Chamber of Commerce is one of only three chambers in the state of Florida that is certified to issue COs. COs are issued online via eCertify or in person in our office. For more information, please contact our Chamber office.